Another bug. This time in Chapter IV. Both bugs seemed random, like the thing ran out of memory. This should be fixed. If you moved really fast in the Info Menu while pressing the R or B button, two mutually exclusive actions could occur at the same time, causing a crash. The newest upload fixes this. It also fixes text speed. Text speed now matches the other speed options. Looks awesome! I'll try it out when I get home. Just out of curiosity, is there any reason you recommend choosing "fixed growth" in the menu? The hybrid option looks really interesting, though I don't know how exactly it works. 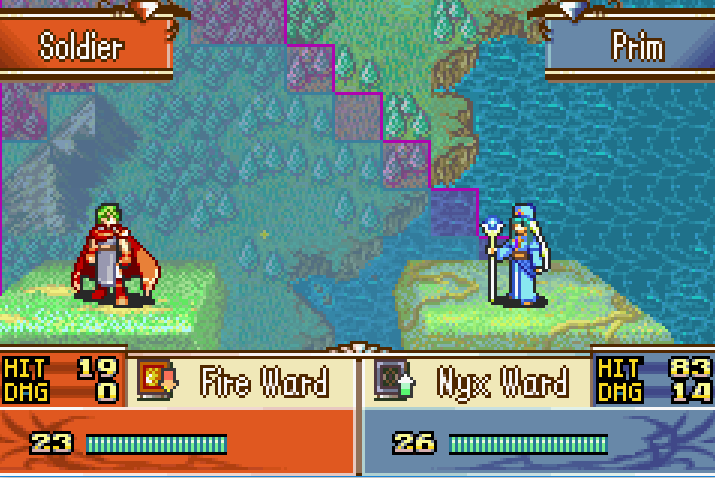 I think I'll go with fixed for my first playthrough to get a feel for the playable units. is this the same one PowerOfKaishin of had? So dl'ing the current version on github should fix it? Yes. This has been fixed. The issues with Nyx Ward and Sandblast + Evasion has also been fixed in the last ten minutes. Thanks for the bug report! You will need to copy over your Saves folder to the new directory when you download it. You can also copy your Data/config.ini file over if you made any changes in the Options Menu. I recommend fixed growth because you don't get too many characters in this game. There are few-to-no replacements for some roles if one turns out poorly. So it's only been tested on fixed. However, don't let that stop you if its more fun for you to have it truly random! There are several stat up items, and each character has at least three Feat skill choices (which lets you choose a stat buff) at levels 8, 13, and 18. Hybrid growth works kind of like Radiant Dawn's bonus exp system. In Radiant Dawn, it would choose 3 stats to level up, where the chance for any individual stat was dependent on its growth rate in comparison to that character's other growth rates. Hybrid works like that, except it chooses (Total Growth Rate/100) stats to level up. So you will never get those empty level ups, but which stats level up is still random. Thanks for the report. A new build with this fixed will be up soon. If you don't want to download all those megabytes again, its a real quick fix on your end. I forgot to give Female Oracles the script for their Dark Magic animation. You can add one yourself easily. If you go to Data/Animations/Oracle/, there is a file called "Oracle5-MagicLight-Script.txt". Copy it, and name the copy "Oracle5-MagicDark-Script.txt". That's it. Now Prim will have a Dark Magic animation. You should be able to load from the last turn change with Continue in the Main Menu. I do have a bit of experience with Scipy/Numpy, will it help understand the codes if i take a look at it and/or want to edit/make something? The structre of the Data files i saw do look a bit familiar, and the sprites seem to be arranged in such a Way as to resemble Matrices. And if i have to take a guess, the Maps are also programmed in as Matrices/Arrays, no? The Master Edge seems to give the user +30 avoid (but no +30 hit) against non-sword wielding enemies. I've tested it out on many enemy types. I don't think it's supposed to have that effect. If you don't want to re-download -- the fix is localized to one data file. If you replace your Data/status.xml with https://raw.githubusercontent.com/rainlash/lex-talionis/master/Data/status.xml that weird effect will go away. You can right-click that page and then click "Save As" to get a copy of the updated file. Or you can just re-download -- whatever's easiest. @rainlash do you have discord? i'd love to learn how to use your engine, altho i should prolly wait for the full edition. but still, could be fun? 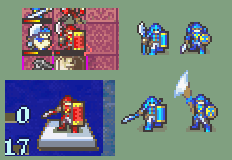 If you need an axe armor sprite the map sprite repository has one. If it doesn't meet your needs, it can at least serve as a placeholder until you get an original sprite made. Hey, Rainlash! I'm trying to learn how to use Lex Talionis to make my own fangame, but I have no idea where or how to install the Level Editor. Please help. Wow an aoe magic spell, what in the name of Einstein is that? Hey! I assume you looked at the Wiki on the Lex Talionis Github page? The next release (v0.8.0) for this project includes a lot of small changes (critical animations, yay!) and one big change, the Level Editor, which should help people create their own levels. But I'm not quite done testing yet. There are probably still a couple of bugs lurking in the Level Editor code, and the tutorial has not been cleaned up for readability. I don't have a date for when the next update will be released (definitely by the end of June though). However, if you really want access to the current version of the Level Editor, there is one way to get it. 1. Clone the Github repo: `git clone https://github.com/rainlash/lex-talionis`. 2. Checkout the "level_editor" branch: `git checkout level_editor`. This is the development branch. 3. You will find the level editor code under the "Editor" directory. Run the LevelEditor.py script like any other python script `python LevelEditor.py`. You will need Python 2.7+ and Pygame 1.9.1+ like the Github page specifies. I give no guarantee that the code is bugfree. By the end of June I should have a better method (I plan on compiling it and distributing it as an executable just like I did with the The Lion Throne proper). If you do follow this method and run into any snags or bugs, please PM me here. It's not a ROM Hack, but a fangame. You just run it. I didn't even think about the smiliarity between the two map Sprites when I played through the game last August. Will you guys be working on future games after you're done polishing the engine? I really liked the characters, gameplay, story and base mechanics. Anyway, you should be able to load up that turn again. Navigate to Options and turn off DISPLAY HINTS. This way you won't be forced into trying to attack a non-existent entity. Alternatively, you can restart the level until the Soldier gets a better level-up. Sorry I'm not more help. Thanks for telling me about the issue. It will be solved in the next release. Thanks! I'm glad you enjoyed it. On the topic of another game, I'm not really sure... I'm only one person and making this was a vast undertaking. I've got some ideas for another floating around, but with writing a whole new script, making character sprites for every character, level design, and then all the testing (which I'm obviously not perfect at)... It'd be a lot of work. We'll see what the future brings.